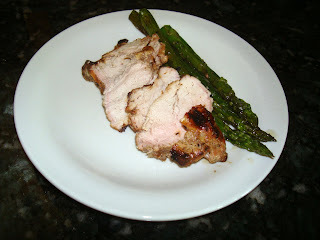 Today for lunch we had grilled pork loin and grilled asparagus. 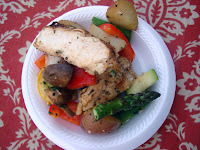 I used some of the ideas from Laura's grill class Thursday night. It was yummy and very tender. 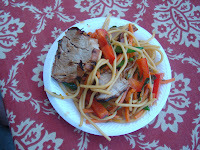 I tend to overcook pork so it was good to be reminded not to over cook. I used her flank steak marinate for the pork loin. Here are some pictures from her class. I was surprised how good the grilled fruit was over ice cream. I've never done that myself. I think it brought out the sweetness in them without adding sugar. It was fun. Go over to Laura's blog and see her report from her class. I think she may have a recipe up. In the mean time I'm busy sewing. Of course. Looks yummy! I will imagine the ham sandwich I eat for supper this evening is actually grilled pork and asparagus. We need to buy a new grill but until we add the deck to the house, we won't buy the grill. I will definitely try the grilled fruit as it sounds very tasty!! Carry On!!! That's what I have to remind myself! 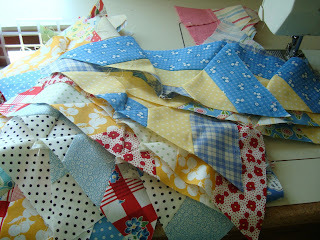 I have a lot of piecing to do and with omigosh and dear jane it seems insurmountably difficult! Definition of insurmountable (I even looked it up) it means "to great to be overcome" LOL! That's how it feels some days but I just tell myself that quilting is a process just like becoming more like the Savior. It takes time and effort with great rewards at the end! I learn so much from quilting!! Love the quilt blocks you're working on. Nanette - Where do you live again...I'm coming over for dinner (lol!) Looks good! I used Laura's Smore Cupcake recipe. It was yummy and so cute! I've never grilled. 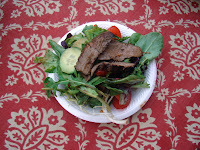 I leave the duties to my husband who will gladly grill (meats only) and it's raw, rare, or burnt! He gets distracted doing things in the yard while grilling. I'm not a fan of blackened hot dogs. Perhaps it's a cajun delicacy in Louisiana. Learning to grill is on my to do list! 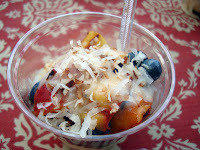 This looks so yummy, and thanks also for the great link to Laura ! Hugs & smiles to you, Nanette ! I think I saw you in the picture on Laura's blog??? LOL! That class looked like lots of fun!